In the NY Times piece, “Patient Voices: Fibromyalgia”, six men and women speak about living with fibromyalgia. And guess what? Patient #6 is me!!!! For more information on fibromyalgia and to support fibromyalgia awareness, check out: National Fibromyalgia Association. 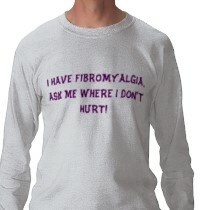 You can get the shirt above and other amusing fibromyalgia t-shirts at Zazzle. I’m also a big fan of “Fibromyalgia: Not for Wimps. But I do feel like a bit of a wimp. All the time. Please watch the 60-second PSA below to learn more about fibromyalgia! Previous Post Where will you be this Shabbat? You're in the NY Times!!!! I'm jealous 🙂 I was diagnosed with fibro in 2002. I've been doing a lot of different things to see if it helps. Good luck to you. I know it can be such a “pain” sometimes.